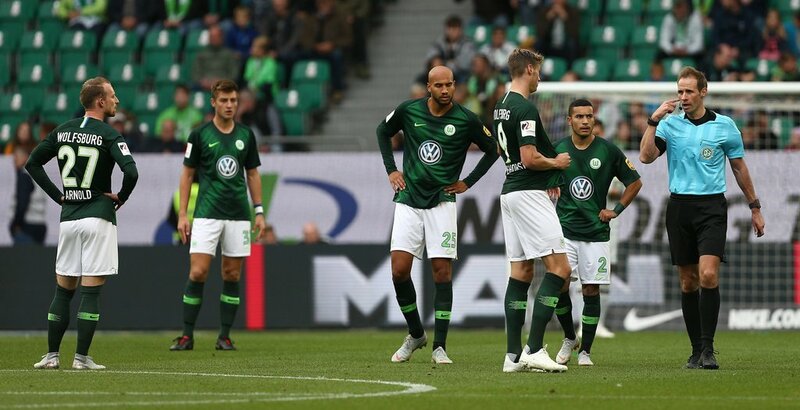 Wolfsburg welcome Eintracht Frankfurt to the Volkswagen Arena on Monday night as the pair do battle at 7:30pm in the Bundesliga.The visitors are currently placed in fourth position with fifty-two points after twenty-nine games, six behind RB Leipzig and one clear of Borussia Monchengladbach. The hosts on the other hand, occupy ninth spot and are two points from the Europa League qualifying places. Wolfsburg have lost three of their last five matches, winning the other two and failing to keep a single clean sheet while not scoring in any of those defeats. After getting beaten by league leaders Bayern Munich away from home by six goals to nil, they then crushed Fortuna Dusseldorf in a resounding 5-2 mauling of their opponents. Wolfsburg came up against Borussia Dortmund in their final encounter of March and suffered defeat as the match finished 2-0 in favour of Lucien Favre’s men. A 3-1 victory over Hannover 96 handed Wolfsburg a good platform to begin a solid run of form, however they could not build on that performance and were subsequently on the receiving end of a 2-0 loss versus RB Leipzig last time out. Wout Weghorst has scored twelve goals during the campaign and that record puts him top of the charts in terms of getting on the scoresheet at the club as the 26-year-old has netted double the amount of second placed Admir Mehmedi. His last strikes came in the victory over Fortuna Dusseldorf, in which he bagged a hat-trick and created the other two goals for his team. The Netherlands attacker has also made the most goals for the side with five assists in total, one more than Maximilian Arnold and two ahead of Josip Brekalo. Eintracht Frankfurt would have come into this tie with plenty of confidence had they not been beaten in their last two outings, with their preceding results having gone the best way possible as the side were unbeaten since prior to Christmas. Following a solid 1-0 victory over Nurnberg last month, the international break put a temporary halt to their excellent form. However a 3-0 success when hosting VfB Stuttgart was the perfect way to start domestic football again, which was followed by a 1-2 away beating of Schalke through goals from Luka Jovic and Ante Rebic in either half. However, in the first leg of their Europa League quarter final with Benfica they were defeated 4-2 in Portugal, while their most immediate Bundesliga fixture arrived as a shock 1-3 loss to Augsburg on home soil. 21-year-old forward Luka Jovic has taken the league by storm this season and his form in front of goal has garnered worldwide interest from some of the biggest clubs in football. The Serbian has netted seventeen goals in the Bundesliga and provided five assists for teammates, with three of those goals coming in his last four appearances for the team. Sebastien Haller has gone under the radar due to Jovic’s impressive performances, bagging fourteen goals for himself, although he is an injury concern for this one and will be missed if he is forced to watch from the sidelines. In terms of assists, Filip Kostic has been the main supplier with ten, one ahead of Haller and four clear of Jonathan de Guzman.